The Mars Series-DR is a universal purpose stand that allows radiographic exposures on a patient in standing, lying or sitting positions. The vertical movement are motorized. In combination with a mobile stretcher the Mars Series-DR unit is a very efficient solution for emergency or basic general purpose rooms. Post processing software provides complete control of all image capture functions within the examination room, enhancing the entire work flow by delivering diagnostic images instantly, and allowing users to move X-ray images electronically to remote workstations, image archives, and printers. It also has the super excellent performance on image quality control. Remote Controlled RF table with or without Spot Film Device. 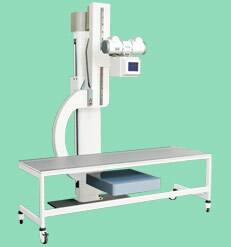 Rotating Anode, Dual Focus with Manual / Automatic Collimator. Output Power : Options of 30 / 40 / 50 / 50 + / 65 / 80 KW generators based upon requirement. 440 Volt, AC, 3 Phase, 50 Hz. with line regulation of ± 10%.